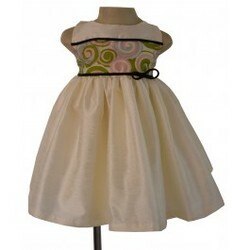 A darling selection, this little girl’s party dress has a sleeveless bodice with a panel of swirly multi-colour silk fabric. Black braided trims and a bow adorn the bodice. The Cream coloured skirt is gathered and is voluminous. This Beautiful party wear frocks Available at Faye India.